Follow what lights you up, and you'll light up the world. 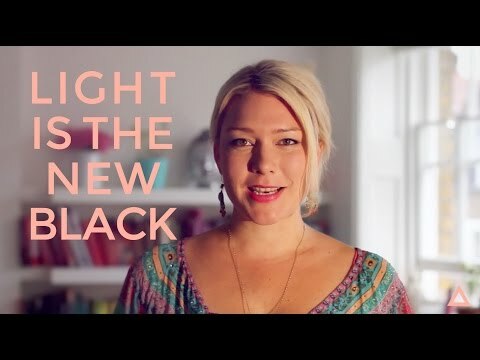 Light Is The New Black is a guidebook for a new breed of women who are here to be bright lights in the world—modern-day lightworks who agreed to be here at this time in history. In order to thrive in this new age, everything we do must. Be an authentic expression of who we truly are. Light Is The New Black will guide you back home to the callings of your soul so that you can light up the world with your presence. Rebecca Campbell had her first awakening when she was a teenager. But without anyone to guide her, she ignored her soul's callings and dimmed her light in order to fit in. Then, just before her 30th birthday, the life she had so consciously created began to crumble around her. It was as if the Universe turned off all the lights so that she had no choice but to rediscover her own. In these pages, Rebecca shared her own journey, while also sharing practical tools to help you reconnect with the core of your being, and channeled messages from the Universe. Once you rediscover what you already know at soul level, you can offer the world something that only you can give. Rebecca Campbell is a writer, intuitive spiritual mentor, inspirational speaker and teacher. Drawing on her experience as an award-winning advertising creative director at a Fortune 500 holding company, Rebecca guides women to courageously answer the unique callings of their soul so that they can light up the world with their presence. Amazing! A must read for emerging into your greatness! This book urges you to give into your soul's calling, that niggling feeling you get that you need to do something more in life than what you're doing now. Practical suggestions, and tools to apply to your life that work! The author also shares her experiences, and gives us hope that we can all walk our path, whatever it is, and be soulfully happy! Needs to be read with a notebook...there willl be lots of notes, thoughts, reflections & light shining. Rebecca writes very well, she gets her ideas across easily. But sadly this book is for beginners. To those of you who have many yeas experience on the spiritual path don't bother reading this book. I highly recommend this book for people who are just starting out on their journey. Love this book! Possibly my favourite non fiction book. I love this book and have brought copies for friends. Flick to any page and you will find a gem. Mosern, inspiring and thoroughly practical. A must read book for the 21st Century. Tiger, Tiger Is It True?